Sergejs Jegers was born in 1979, in Jelgava, Latvia. After attending the Riga Music Boarding School, he entered the Latvia Academia of Music where he received a Bachelor’s degree in 2003 and a Master’s degree in 2005, studying under professor Karlis Zarins. Sergejs has also enriched his mastership by studying in Schola Cantorum Basiliensis in Switzerland under professor Andreas Sholl and in master classes under professor Robert Expert in France. While studying Sergejs worked as a music teacher in the day centre for people with learning disability “Saule” (1997-1999) and in the orphanage “Vita” (1996-2005). 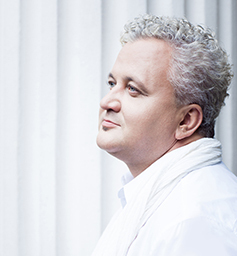 His career as a professional singer begun in 2000 when Sergejs started performing in opera studio Figaro at Music Academia. Since 2001 Sergejs Jegers has been performing regularly in Riga and other places in Latvia. He’s been singing in Riga Dome Church, St Johns Church, St Peters Church and other places. In 2005, the singer performed solo concerts in the Mezzanine Hall of the Latvian National Opera. In 2007 he had his solo concert on the Main Hall stage at the Latvian National Opera and in 2006 at the Blackheads House in Riga. Sergejs Jeger’s opera debut took place in the role of the Angel in Rubinstein’s opera Demon at the Latvian National Opera in 2004. With this role he also delighted the audience in Opera Festival in Savonlinn, Finland in 2004. Sergejs has performed in various musical productions: as Orpheus in Gluck’s opera Orpheus and Euridice at the Cesis Cultural Centre in 2004; in the role of Ruggiero in Handel’s Alcina in 2004 at the Latvian National Opera; in the title role in Handel’s opera Rinaldo at the Rundale castle in 2004. Jegers has also taken part in the performances of grand music forms which includes Handel’s Messiah, Vivaldi’s cantatas Gloria, Stabat Mater, Cessate, o mai cessate, o mie porpore piu belle, Nisi Dominus, Pergolesi’s Stabat Mater, Bah’s Mark’s passion, Purcell’s Ode for St Cecilia’s Day and other works. The singer has also performed guest concerts in Poland, Lithuania, Estonia, Russia, Germany, UK, Byelorussia, Kazakhstan, Spain, USA, Canada, Finland, Portugal, Italy, Sweden, Egypt, The Netherlands, France and other countries. Jegers has also participated as the only counter tenor contestant in the finals of the prestigious vocal competition BBC Cardiff Singer of the World 2005 and has achieved significant 6th place among 25 finalists. In September 2008 the singer got into semi final at Luciano Pavarotti’s Tenor Contest in St Petersburg, Russia. The first solo album of Sergejs Jegers Ave Musica was released in 2006 by Upe Tuviem un Taliem. In 2007 his second album Duende was released in duet with saxophonist Artis Gaga by Upe Tuviem un Taliem. In the mean time whilst working on his album, Sergejs Jegers had a documentary filmed about his life (directed by Davis Simanis). Also a video was made for his sound track Panis Angelicus (directed by Una Rozenbauma). In 2008 Sergejs Jegers recorded an album Dziesmiņās remdējos with Latvian folk songs, arranged for voice and orchestra by Raimonds Tiguls. Since September 1, 2009, Sergejs Jegers teaches early music and singing at the Latvian Academy of Music. 2012 - 2015 member of Charity organization Riga Ridzene Rotary.